I managed to spend an hour or so today, exploring the latest preview of Update 23 for LOTRO, that is currently being beta tested on the Bullroarer server. Sadly, due to my schedule, I did not get to spend as much time as I would like, exploring the new zones, and by the time I reached the Withered Heath, the server closed. However, I did see sufficient for me to be able to gauge progress. Overall this is an interesting zone which offers new iterations of Dwarven culture. Standing Stone Games once again have found the right balance between using established in-game assets and integrating them with newer designs. The results are two regions that are bright, roomy and distinctly Dwarven. However, it should be noted that as ever with these beta previews, the build is subject to change. Update 23 focuses on the Longbeards, descendants of Durin the Deathless. To begin with, there is an expanded version of Erebor, which adds far more to this Dwarven capital. There are now ornamental gardens, Gemcutter’s court and even a theatre. It certainly feels more like a thriving community. SSG have also added the legendary mines where the Arkenstone of Thrain was found. For those expecting tunnels and diggings like those seen in Peter Jackson’s The Hobbit movies, we’ll you’re in for a disappointment. They are depicted here in the same way as they are elsewhere in LOTRO, IE in a functional and practical fashion, with linear tunnels and mine car tracks. It may not look as opulent as other depictions, but it feels authentic. East of Dale, SSG have created the fabled Iron Hills. This zone is spacious with a mixture of green plains and brown “hills” filled with iron ore. Hammerstead is the major Dwarven settlement of the region and there is ongoing conflict with the Easterlings, who have occupied one of the other towns in the area. It should be noted that there is a clear influence of Easterling culture on Dwarven armour and weapons in this region. This is also apparent in the Grey Mountains to the North of Erebor. Here we find another Dwarven enclave, Skarhald. This area has clearly suffered under the depravations of Dragons and the zone is littered with their ancient bones. There is a nearby mine, Glimmerdeep, that has fallen to Orcs from Mount Gundabad. This delving is very reminiscent of the Silvertine Lodes in Moria. 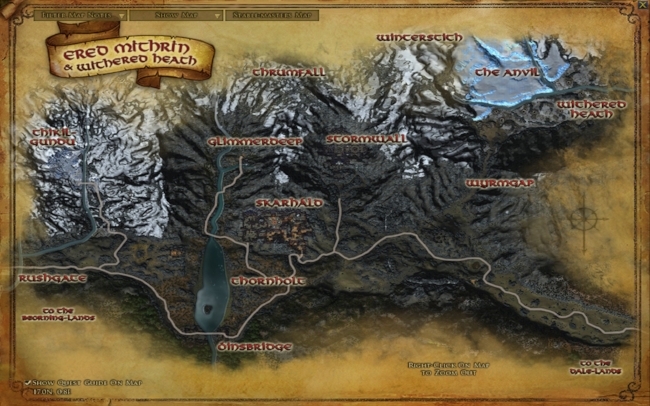 The Witherted Heath is an interesting addition to the game, featuring bleak and fire blasted steppe region with a large glacier extending down from the mountains. It is also populated with drakes and worms. As well as new zones and Epic Story content, there are two new Instances for up to three players, and one new Instance for up to six players, in development. There are also ongoing changes to the Hobbit avatars, to bring them in line with the updates made to the other races in recent months. It should be noted that Update 23 will bring an increase in level cap, from 115 to 120. Naturally, the chnage will bring about new gear and cosmetics items, and no doubt there will be yet more factions to gain rep with. Overall, it seems very much like business as usual for LOTRO with this forthcoming update, but as this seems to be what players enjoy, then it is by no means a problem. Certainly, these new zones are a welcome addition to the game and an uplifting alternative to Mordor that still remains a crossroad (or dare I say stumbling block) in the game for some players.